Two weeks later, I turned 20 years old; old enough to apply for pilot training in the army air corp; so I applied. I failed the physical exam. The doctor said my pulse was too high. I don’t think it was very high; maybe 80 beats per minute. He said I had 3 more chances, and to come back in a week. I did, and my pulse was 90. I knew I was not going to pass with the Army, so I applied with the Navy and passed. Strangely, there was a Navy base at Kansas City. It was across the Missouri River at Fairfax Airport in Kansas. The Navy had a pilot training base there. I entered the Navy in March 1942. It was a strange world. The floors were called decks, and the walls were called bulkheads. Water fountains were called scuttle butts. I entered the Navy as a seaman second class which is about as low as you can go. If I passed my preliminary training at Fairfax, I would be commissioned as an air cadet and be transferred to a major training base. I was given some flying clothes and a uniform which consisted of wool brown pants, a wool shirt and a peacoat for wearing outside. This was not a regular seamans uniform because I was not a regular seaman. I was a pilot trainee. I would receive a cadet uniform when, and if, I passed the training at Fairfax. The airplanes we trained in were open cockpit biplanes which were painted yellow. There were about 20 in my class. We stayed in a building next to the hanger and slept upstairs. At night we sometimes made too much noise so the duty officer got after us. If we made a lot of noise and the duty officer was in a bad mood, he would have us get up, get dressed and walk up and down the ramp. Our flight training was learning to take off and land the Navy way. The Navy wanted their pilots to land with the tail down; no wheel landings. This was because on aircraft carrier landings the tail of the airplane had to be down to catch the arresting cable. We were taught formation flying and spot landings The Navy used a circle in the middle of a field as the spot the pilot was supposed land in case of engine failure. It was a complicated procedure of circling to glide into the spot. My flight instructor was Lt. Kraft. He had lots of experience. Thanks to him I got through E base training and became a cadet. Out of 30; 10 were eliminated. We 20 cadets were loaded on a train and traveled to Jacksonville, Florida. The train trip to Jacksonville took several days. I think several of the boys were drunk most of the trip. They took some booze on the train with them. When train stopped at various towns they got off, and it was interesting to see if they got back on before the train left. We all made it to NAS Jacksonville and got installed in nice quarters. The rooms were nice. There were two cadets in each room. We arrived at Jacksonville in June 1942. In March 1942, a German had sunk a ship in view of the sun bathers at Jacksonville beach. The naval air station was only 20 miles from the beach, but the Navy there could do nothing. There was no equipment to fight submarines. I started flight training at Jacksonville by taking a check ride in a primary trainer. After I passed that, I got checked out in a OS2U. The OS2U was a scout plane installed on cruiser ships. It was a float plane which was catapulted off the ship and flown out a 100 miles or so to look for the enemy. After the pilot completed the search he flew back to the ship and landed on a slick created by the ship. The OS2U was then hoisted aboard ship. The OS2Us we flew at Jacksonville were on wheels. The OS2U was a slow airplane with only a 450 horsepower engine. The OS2U instructor pilot sat in the back seat; the visibility back there was bad. The instructor pilots were good to their students. They didn’t want the student to get upset and make a mistake. Formation flying training was done with 6 to 9 airplanes attempting to fly a descent formation. This was not always neat. The instructor flew an airplane at the rear of the formation and criticized as he saw fit. One instructor expressed his displeasure by swearing “well Jesus Christ” a reply came over radio, “this is Jesus Christ go ahead”. 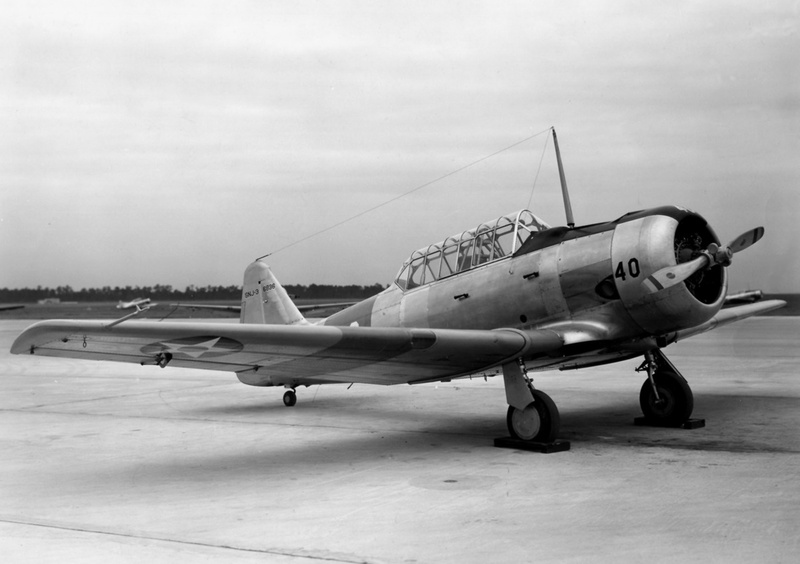 The Navy’s way of identifying their airplanes was with letters and numbers. The OS2U for example was O for observation S for search 2 for model and U for manufacturer which was Chance Vought. My next trainer was SNJ 3; N was for training and J was for North American. The SNJ was faster than the OS2U. It had retractable landing gear and a more powerful engine. My next training after soloing in the SNJ was 10 hours of instrument flying in the back seat of the SNJ under a hood. The instructor had the fun during this course. He would occasionally relieve his monotony by buzzing small towns or flying at 100 ft. over various small lakes. After the instrument flying I went on to my last course. This was multi-engine training. The airplane I trained in was the PBY, a 2 engine flying boat. The PBY seemed more like a boat than an airplane. Some of the fixtures were made of wood, the control wheel for example. The flight engineer sat on an elevated platform at the rear of the flight control compartment and had control of fuel. The pilot did have two throttles so he did not have to call the engine room and ask for full steam ahead. The Navy joke about the PBY was that it took off, landed, and cruised at 80 kts. Not quite true, it could cruise at 120 kts. The good thing about the PBY was it could stay in the air for a long time, about 18 hours. 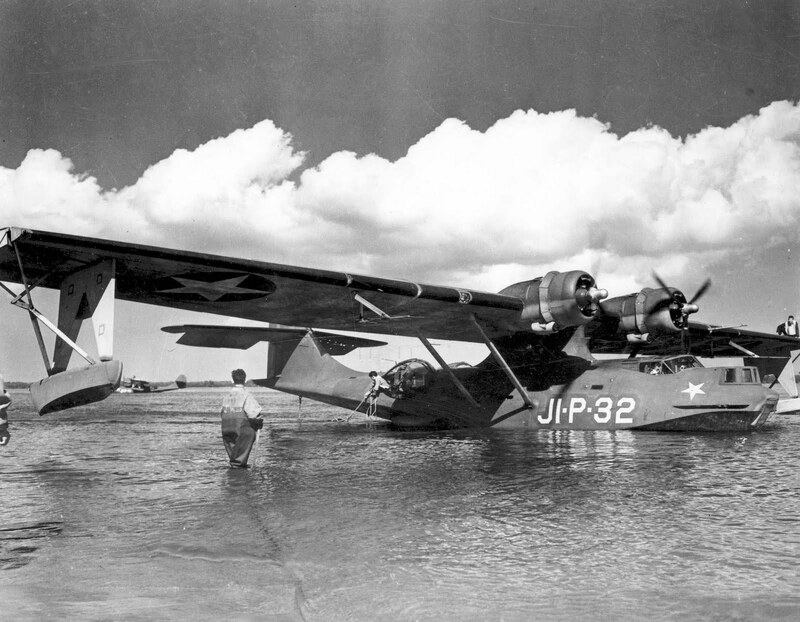 The PBY was built for searching for the enemy. I finished my flight training at Jacksonville Oct. 6,1942 and was commissioned as an Ensign. My date of rank was October 1, 1942. This could be important for pay purposes. Jacksonville had been a fun place to be at. The ocean beach was only 15 miles from the base, and that was a fun place to go to on any weekends off. After graduating I requested duty on the west coast, mainly because I had been there before, but I got orders to report to Norfolk, Va. for further assignment. I arrived by train in the vicinity of Norfolk, but had to take a ferry boat to get to the Navy base. I walked out on deck of the ferry boat with a hot dog in one hand and a coke in the other and my new Navy hat blew overboard. The Navy was big on hats. If you were outside you were supposed to be covered, ready to salute or be saluted. I was worried about reporting to the commanding officer without my hat.